Come Play On Bryce Canyon’s Doorstep! Book Your Next Family Reunion , Group Retreat or Camp Now! We are closed until March 27, 2019. Limited sites available during the winter (first come, first served) with Electric Only at small overflow park behind Best Western PLUS Ruby’s Inn. Now accepting reservations for 2019. Traveling with all of the comforts of home? 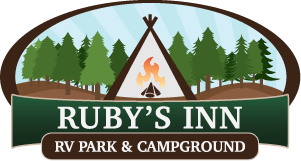 Ruby’s Inn Campground has parking available for RVs, camp trailers and campers. All of the 150 shady and open campsites have electric and water, or FULL hook-ups as well as a large pull-through area for the driver’s ease and comfort. Rather stay in a tent? Set-up camp at one of Ruby’s beautiful campsites nestled in the pines. Head out for a day of exploring in some of Utah’s most breathtaking country including Bryce Canyon National Park in our own backyard. At the end of the day campers can use restroom and shower facilities or the outdoor heated pool before settling in for a quiet, relaxing evening under the stars. There are no extra fees to use the facilities, it’s all included in the low nightly rate! Traveling with a group of family, friends or co-workers? Ruby’s Inn Campground has several larger campsites available to accommodate larger groups whether they’re packing tents or staying in an RV or camp trailer.